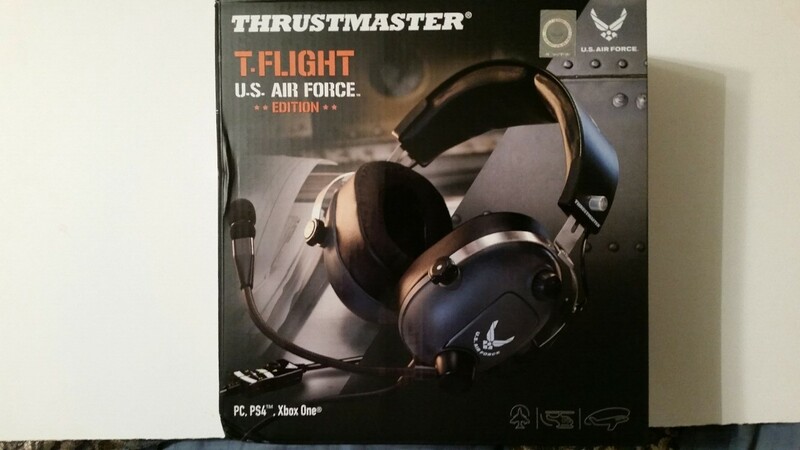 We all know Thrustmaster’s reputation for flight sticks, HOTAS, pedals, etc. 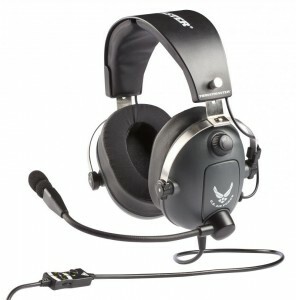 I’ve known that they do headsets but I never thought of them as a headset bunch, you know the flight gear folks. Of course if you look at dogfighting, one of the key components is communication. Yeah, Gunny is dense sometimes. Doing my pre-getting-my-hands-on-the-headsets research, I found that Thrustmaster actually has a good variety of headsets in the offing. These are themed differently such as the T.Racing Ferrari Edition and the Far Cry 5 Edition. They are compatible with a variety of platforms, from PC to Xbox to PS4 to Android. TM also lists compatibility with a wide range of consoles, PC, tablets and smartphones. Other features include a high performance omni-directional microphone, memory foam cushions with gel layer for comfort, and nine feet of cord for any gaming set-up. One item listed that I had no clue about was the actual audio performance, namely “True 50mm/2-inch analytic drivers provide crystal-clear audio without any saturation.” OK, I get that. “Provides audio feedback designed exactly as game developers intended, thanks to the stable frequency response curve that has been optimized for gaming sessions, with perfect balance between bass, mids and treble.” Fully optimized, sounds cool. “116±3dBSPL output for elite distortion control (≤1%) and precision.” Huh? So I went looking for what that all meant because I’m not the kind to leave things much to chance. Basically what I found was that all headphones are rated between 80-125dB. The SPL is the power output rated for the speakers. If I read that correctly it would mean the headset handles sound great (Yeah, I wasn’t really going to bore you with the all the details, it would be an article all on its own). There are a few other features that I like with this set-up. The volume control is on the left ear piece. This makes adjusting easy as you don’t have to fumble with an inline adjustment, as is standard on some headphones. What is in-line is the mic mute switch and mic input volume control. The mute button is an up/down slide switch and not a button. Don’t know how many times I went to talk after getting up to grab a drink and had accidentally pushed a button on another set and muted myself. two sets of spare side plates. The microphone comes separate from the headset itself and simply plugs into the jack on the left ear piece and you are off and running. The spare side plates allow for some customization. The plates are magnetic so you can change the standard air force logo for two others. A neat little addition. With the unit assembled, I was ready to do some testing. I was impressed first off by the lightweight design. I’ve been using a set of Corsair gaming headphones, and to be honest, after a couple hours online with my online ArmA team, the top of my head feels like I’ve got a drill press boring into my scalp and my neck gets a tad stiff—and no! it’s not my age catching up to me! The Thrustmaster set sits light and comfortable across the top and the ear piece is comfortable. Next, it was like plugging in something USB that just works right off the bat—definitely plug and play. Some of the computer sound didn’t work right off like mouse clicks and such, but my first test was with some of favorite tunes just as a test. I’ll tell you now I heard some things in my music I don’t remember hearing as the sound was crystal clear. Armed with the new set-up, I hit one of my favorite games, Tom Clancy’s The Division. For those that don’t know, The Division is a third-person shooter featuring a wide variety of firearms, explosives, and such mayhem. Oh WOW! One of my favorite weapons is the M1923 Thompson sub-machine gun, and to hear it chattering in all its non-distorted glory was enough to get my blood pumping. It was a thrill. The next test during our usual Friday night fight in multiplayer co-op ArmA. I was really anxious to try voice comms with the new gear. I was not to be disappointed. I’ll happily report that the entire team was very impressed with how clear my voice sounded, and also, how LOUD I was—they all had to turn down my Discord channel’s volume so I wasn’t blasting them out. Also, because of the design of the mic, they were not picking up the fan I have in my office that I have on because let’s face it, I’m in Texas. It gets hot here. And again, the sounds of the fire fights, artillery and C4 explosions, and thup-thup-thup of helicopter rotor blades, were amazing. I figured, though, that a true test of a Thrustmaster product would not complete without trying them out in a flightsim. And even though me and DCS World don’t get along to well, the next day I took to the the skies with my friends from CSIM’s Bessie’s Bastards squadron in my AV-8B Harrier. 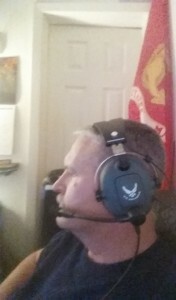 Again, amazing sound so clear that I may actually fight with DCS and get airborne again. After gaming, listening to tunes and watching some TV with Thrustmaster’s T.Flight U.S. Air Force headset, I really can’t find much wrong with them. 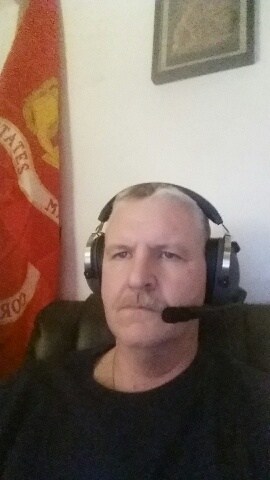 CSIM’s publisher said I had to post a pic or two with me and the headsets. I warned him. 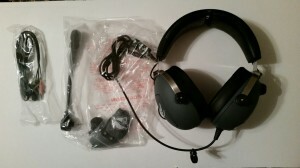 I would definitely recommend these headsets to anyone looking for a good replacement or as a starter. They are light, comfortable and deliver amazing performance. The sound quality is really that good. The T.Flight U.S. Air Force headset retails for $99.99, and for combat simulation folks, who demand hi-fidelity in all things simulation, that’s a bargain.